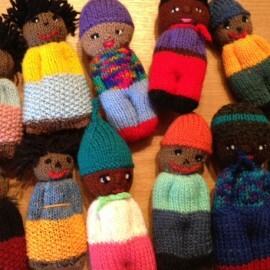 These lovely dolls have been sent to us by a new group. They call themselves Knit ‘n’Natter and meet once a month at Garden Lane Church, Chester. We have sent them some yarn and patterns and they are busy making the next batch of goodies. If you have a knitting group, get in touch with us and we can supply some materials, equipment and patterns for your knitters. Dolls will bring comfort to children who have been under stress either through displacement, illness or bereavement. We are gathering these together to send to a children’s hospital. If you know a hospital or hospice that would benefit from a parcel of goodies from Knit for Peace, let us know.